The penetration of distributed energy resources (DER), such as residential-scale Photovoltaic generation (PV), is increasing owing to their renewable nature and locations closer to electric loads. However, the high penetration of these resources render problems including excessive voltage variation and violation of voltage limits. Some of these problems can be mitigated by equipping DERs with smart inverters which offer functions to control voltage, power flow, and frequency on distribution systems. Contemplating the potential benefits of smart inverters, the power industry has recently introduced new regulations (California Public Utility Commission Rule 21 and IEEE Standard 1547) for their integration in the system. These regulations have paved the way for large-scale deployment of smart DERs. Given the novelty of this technology, there is much uncertainty in the industry with regards to the effects that a large number of autonomously operating smart PVs have and electric utilities are keenly interested that these inverters have control settings that maximize their performance for providing grid support while eliminating unexpected consequences that are detrimental to power quality and system stability. The focus of this article is on smart PVs capability of autonomous Volt-Var control. We discuss the relationship between the Volt-Var curve characteristics and (1) voltage control effectiveness and (2) undesirable voltage and reactive power oscillations occurring during the voltage control process when these smart PVs are deployed in large numbers in a secondary distribution system. This discussion will guide utilities in selecting Volt-Var curves that maximize the PV’s potential to support active voltage regulation without causing adverse effects. Smart PV Volt-Var control provides dynamic reactive power (VAr) output (absorption or injection) through responses to voltage measurements. The amount of reactive power output from the PV is dictated by a curve defining the percentage of available reactive power versus per-unit voltage at the PV terminal. Var production is curbed if the total apparent power (VA) output that can be determined from the reactive and active power outputs would exceed the PV’s VA rating and the PV is set to active power (Watt) priority (i.e., the inverter is running out of “headroom”). The Smart Inverter Working Group (SIWG) is working on establishing default settings with regards to (1) the shape of the Volt-Var curve (i.e., slope, deadband, and maximum reactive power capacity) and (2) the fastest allowed change in Var output from the inverter in response to either power or voltage changes (i.e., the Var Ramp Rate Limit) without extensive performance evaluation of various curve settings. Consequently, the default SIWG curve is potentially overly conservative and it does not fully leverage smart PVs potential for grid support because, most of the time, the VAr outputs of the PVs are limited to values that are below the available Var capacity of the PVs. Also, smart PVs can have autonomous or centralized control. In autonomous control, a smart PV responds autonomously to local voltage, whereas, the output of smart PVs is decided at a central location based on measurements from sensing devices deployed on the feeder (e.g., intelligent switches, remote fault indicators, and the smart PV device itself) and then conveyed to all smart PVs in the system using a communication channel. Note that an expensive communication infrastructure is needed to facilitate the communication channels required for centralized control and, therefore, autonomous control, which does not require communication, is thought to be a more economical solution. However, autonomous control may lead to unwanted side effects such as voltage and Var oscillations when smart PV penetration is high. Smart PV autonomous Volt-Var control may result in undesirable oscillations caused by interactions of smart PVs installed in the system. Figure 1 shows such oscillations captured by quasi-static time-series simulations performed in OpenDSS for a real world secondary distribution residential feeder with a high penetration of smart PVs. The oscillation results are presented for two different scenarios of Volt-Var control settings (gentle and aggressive) in response to an overvoltage condition started after one cycle. The sudden occurrence of overvoltage causes this PV (and the other PVs) to absorb reactive power in order to counteract the overvoltage. The new reactive power output causes the voltage to change, which, in turn, causes the reactive power to change and so on. This interplay between voltage and reactive power causes voltage and reactive power to oscillate. We assume that PV inverters take one cycle to read terminal voltage rms and to apply reactive power and, as a result, the change in reactive power out from PV is slightly delayed from voltage change at the PV terminals. The oscillations either dampen out after some time (in the case of Gentle curve) or continue (in the case of Aggressive curve). In the former case, the oscillations are detrimental to power quality, but may still be acceptable as they cease relatively quickly (within a few cycles). For the latter case, the oscillations do not cease and, consequently, will cause severe power quality and stability problems on the system. Figure 1: Volt-Var curve settings and oscillations observed at a smart PV terminals. The smart PVs generated oscillations can be mitigated by the application of adequate Var Ramp Rate Limit which forces PV inverter reactive power output to change steadily until a steady state-state, instead of abrupt changes in Var out from the inverters. However, the limit significantly reduces the speed at which the smart PV regulates the voltage. For instance, voltage regulation with Var Ramp Rate Limit may take longer time for regulation that took only a few cycles for Gentle curve without the limit. This may be a concern for some applications. Smart PVs are able to mitigate the overvoltage conditions created by deploying a large number of conventional PVs on a secondary system. The capability of smart PV to mitigate the overvoltage condition depends upon the employed Volt-Var curve. 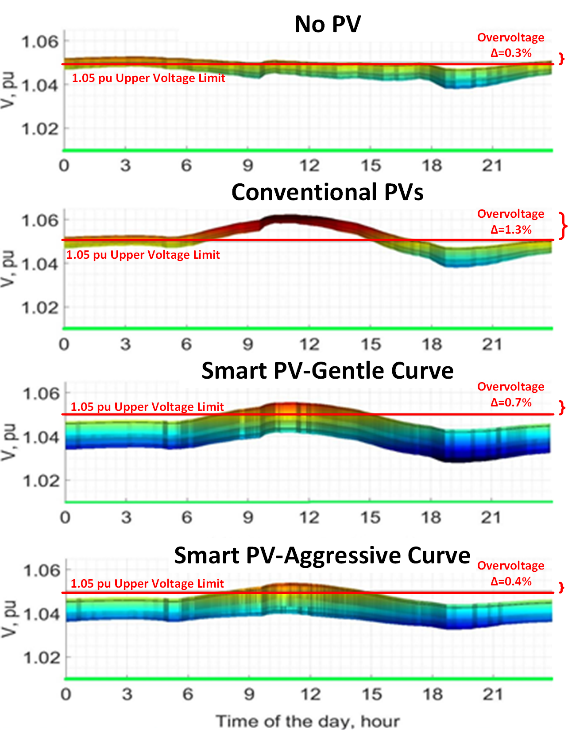 Figure 2 shows the results of our study depicting the voltage at all nodes on the secondary system at each time of day for four scenarios: (a) No PV, (b) Conventional PVs, (c) Smart PVs with Gentle curve, and (d) Smart PVs with Aggressive curve. The voltages depend on the relative location of the node to the generation sources (i.e., the PVs and the sources in the outside system connected through the transformer). Consequently, the node voltages are different for any given time of day. These differences are reflected by the voltage band shown in the figure – without the location dependent voltage differences, the voltage profile would be a single line instead of a band. Figure 2: Voltage profile for four scenarios (No PV, conventional PV, and smart PV). The figure shows that the secondary system already suffers from a slight overvoltage at night in the absence of PV and adding conventional PVs causes severe daytime overvoltages. The overvoltage condition is alleviated by smart PVs Var support. 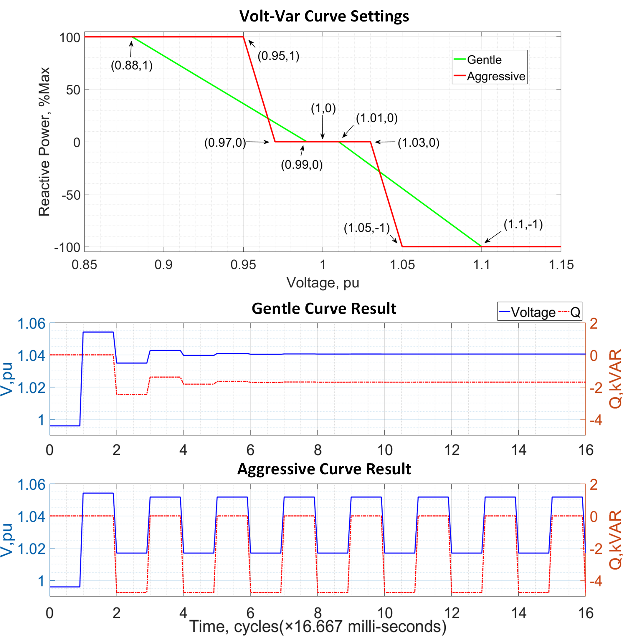 The comparison of results from smart PVs Volt-Var curves with a gentle slope and an aggressive slope shows that voltages improvements are greater for the latter, which is an expected result because the aggressive curve cause higher reactive power output for the same overvoltage. In general, in comparison with conventional PVs, smart PVs exhibit a wider voltage band that is shifted towards lower values, which shows that smart PVs improve the voltages of the system significantly during the day as well as during night hours with the aggressive curve exhibiting more effective voltage control performance. It is important to select Volt-Var control settings for smart PVs sensibly in order to gain effective voltage regulation and at the same time avoiding any interactions among them that are detrimental to power quality. We show the impact of Volt-Var control settings of autonomous residential PVs on active voltage regulation on a real-world secondary distribution system. The aggressive Volt-Var curve settings are more effective for voltage regulation because of their aggressive reactive power outputs. However, the aggressive settings without Var Ramp Rate Limit can result in unacceptable sustained voltage oscillation. In our simulations, sustained oscillations were eliminated by applying SIWG Var Ramp Rate Limit to the PV inverter, although this mitigation measure may not work in all situations and, therefore, future research is warranted. A disadvantage of adding this limit is that the voltage control response takes longer (although it is still much faster than the response of conventional voltage control equipment to voltage changes), which can be problematic for some applications.